The Islamic Research and Cultural Centre was founded in 1979 to do research on Islam. I has an excellent library with several rare and valuable books on Islam in its premises in the Seethakathi Chambers, Anna Salai, Chennai. Books in Tamil, English, Arabic and Urdu are added regularly to its collection, which is made use of by scores of people. The library also serves as a venue for meetings of literary critics on the last Saturday of every month. During these meetings, books are reviewed and lively debates take place. In order to promote quality Islamic Tamil writing, Abdur Rahman has instituted a literary award in the name of Sheik Sadakathulla Appa. This is presented to the awardees on June 21st every year, the rememberance day of Sheik Sadakathulla Appa. In addition to a cash award, the recipients are also honoured with a citation. Awards are also given to senior writers who have rendered service to Islamic literature. Talented writers are identified and patronage is lent to them to publish their works. 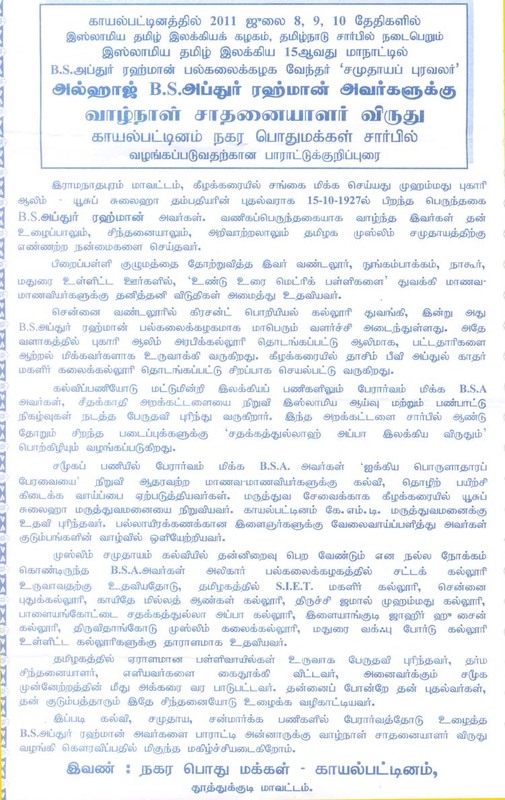 The Fifth International Islamic Tamil Literary Conference was hosted at Kilakarai from December 30, 1990 to January 1, 1991. Abdur Rahman was the moving spirit behind the Conference and Alhaj M. Idris Maraikayar, Alhaj K.S.M. Shahul Hameed Alim Jamali, Alhaj Venerable Thaikka Vappa and Alhaj K.V.M. Abdul Kareem teamed to make it a great success. The Conference was inaugurated by the Malaysian Minister for Telecommunication Dato S. Samivelu. Thavathiru Kundrakudi Adigalar spoke on the cultural nuances of Islamic literature. The then Chief Minister, Kalaignar M. Karunanidhi, delivered the keynote address. 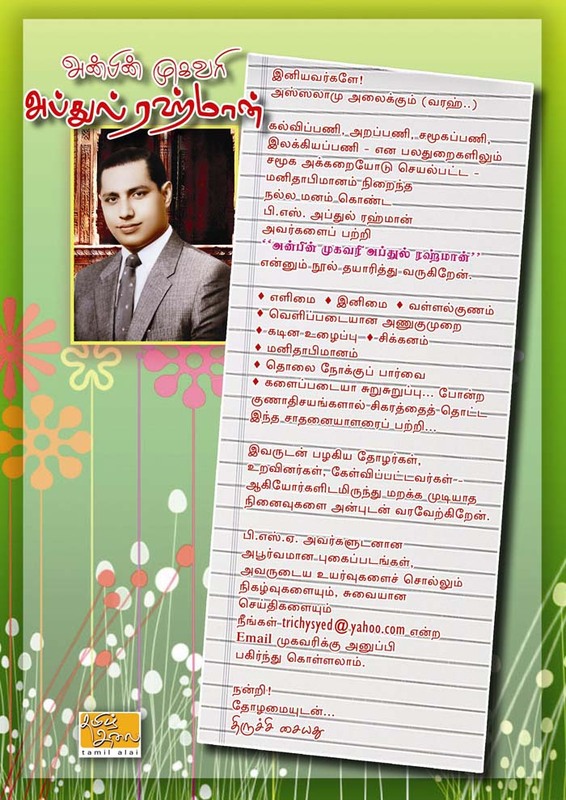 Seminars were held, research papers were read, a session for Tamil poets was conducted, and Dr. Thamizhkudimagan delivered the valedictory address. Several eminent persons were honoured for their services to Tamil literature and Islam. That 200,000 persons came to attend the Conference in such a remote town was indeed a matter of pride for everyone concerned with the international meting that Sena Aana brought to his home town. Janab B.S. Abdur Rahman dedicated to the much needed cause of social upliftment of the weak and the downtrodden, with setting up of more than 25 educational, social welfare organisations, Thiru Abdur Rahman has done yeoman services to the socially as a model for others to emulate. Mr. B.S.Abdur Rahman's pioneering efforts should be applauded by one and all, throughout the last five decades or more he is leading a life which has been the epitome of excellence and a ray of hope for the needy in society. Allahu subhanahu wathala has blessed Janab B.S. Abdur Rahman sahib not only with abandant wealth but also with benevolent and charitable disposition to help numerous less-fortunate men and women by founding several institutions in the fields of education, health , social welfare etc., and running them well. Mr. B.S. Abdur Rahman - fondingly called BSA - is a celebrity in himself. BSA is a shining example of success in business life. He has contributed his share in building a bridge of Goodwill between India and Gulf countries. The yeoman services of Janab B.S. Abdur Rahman to the nation and community in the field of Education, Industry, Trade, social service etc. are well known. A Visionary with a Mission. One can learn many good things from him. I have wondered as to how a such a busy Industrialist and Businessman as he ia able to spare so much time for Humanitarian Service. He is a very relaxed , jovial and informal person. Janab Rahman Saheb associates and works with any good social worker without being conscious of his status in society. I have always admired his business acumen and charitable disposition apart from his persuasive skills and keen desire to complete succesfully any venture he undertakes. A person endowed with humility, Mr.Rahman has a wide circle of friends and is a perfect host. Education and social upliftment of the poor, weak and down-trodden is paramount importance in bringing about peace and prosperity in our great nation. Janab B.S. Abdur Rahman has forced his energies on this aspect of human endeavour and has provided thousands of young men and women with opportunity of achieving their obectives of well being, security and dignity. Janab B.S. Abdur Rahman is a man of par excellence with rare virtues, amiable behaviour and pleasant manners. Inspite of his being one of the world's pioneer businessmen, he has kept up the noble tradition and culture of the country. Mr. Abdur Rahman's sincere services to the country as a whole, and to the society in general and community in particular is commendable. His involvement in the field of education, trade, industry, social service and employment deserves all praise. To uplift the weak and the downtrodden is his mission. Many families have been benefited by his yeomen services. No doubt, his large heartedness and far sightedness have produced many a institutions of excellence through which his services continue to benefit the poor, downtrodden and the under privileged sections of the society. "Allah has granted us all facilities, opportunities and a comfortable life. Don't we believe that there is life after death and that we would face the Day of Judgement? Should we not do something in this world to gain merit in the world hereafter?" This statement of Abdur Rahman holds the key to the uniqueness of his personality. All those who have come into contact with him in one capacity or another agree that he stands several cuts above others. In a lighter mood, he would recall his childhood and relate how he was upbraided by his mother for inflicting cruel jokes on his friends. He does not permit his trusted lieutenants to prevent beggars from approaching him. On one occasion, Abdur Rahman gently advised a trusted lieutenant, V.N.A. Jalal, as follows: " There is no need to ask the peon why he had not dusted the table. You should have picked up the duster and cleaned the table in his presence so that he would follw your example". There follow below the views of many who consider Abdur Rahman a unique individual. He has advocated brotherhood and fraternity, so he is accepted by everyone, wherever they are, as being above party, politics and community. Society needs people like him eveywhere. Alavi Moulana, Minister for Media & Tourism, Sri Lanka. He is not only a businessman but also a philanthropist who has helped people not only in India but in Sri Lanka as well. I always admire him for his goodheartedness. He is always thinking of the downtrodden and orphanages. He always feels that whatever Allah has given him through business should be shared and distributed among the poor. Abdul Hameed Fowzie, Minister of Highways and Muslim Religious Affairs, Sri Lanka. Abdur Rahman is such a simple and humble person, yet he is a person who first initiates, then offers, establishes and fulfills everything requested. He has done this in Sri Lanka as well as all over the world. Mohammed Zuhair, Former Member of Parliament, Sri Lanka. He has been a great help in building the Colombo Grand Mosque, a landmark in Sri Lanka and the oldest mosque in the island. His contribution is deeply appreciated. M.S. Rushdie Uvais, Chairman and M.D., Mackey Group of Cos, Sri Lanka. He appears to me to be an epitome of imagination and creativity. Dr. S. Sathik, Former Vice Chancellor, University of Madras. Once I happened to go to Puliyangudi, a small village in Tirunelveli District. It had borne the brunt of communal clashes and a number of houses had been torched. He undertook to rebuild all the houses and help in rehabilitation of the people affected. He kept his word. Prof S. Peer Mohamed, Correspondent - Cresent Engineering College, Chennai. Whenever he feels that a student needs assistance, he grants him fee concessions even without his asking for it. That is the kind of heart that he has. Dr K.P. Mohammed, Principal - Cresent Engineering College, Chennai. I have often wondered how such a great personality could come down to the level of the children and behave like one of them, endearing himself to the little ones. S. Dawood Shah, Principal - Cresent Residential School, Chennai. Abdur Rahman is a university and those who have the opportunity of working under him learn many things that a university fails to teach. V.N.A. Jalal, General Manager - Seethakathi Trust, Chennai. Age sits lightly on him and he is more alert than people less than half his age. His sociability and conviviality and accessibility have earned for him respect and regard wherever he goes. If a grateful boy falls at his feet, he considers it a sacrilege, and wonders how he will expiate the sin. J.M. Hassan, Personal Secretary to the Chairman. I have never seen him sayig 'No' to anyone and he never rests until he redeems a pledge. He never bears a grudge nor does he listen to canards. If anyone has a genuine grievance, he sees to it that it is redressed. M.S. Syed Abu Tahir, Senior Manager - East Coast Construction & Industries, Chennai. Of all the years wich I have been with him, I only wish to say; He saw a future not for himself, but for the community as a whole, Their well-being was his cherished goal, the mark of a truly great soul. Sheik A. Shakeel, United Economic Forum, Chennai. May Almighty Allah grant him happiness and healthy life in this world and all well-being in the hereafter. May the Almighty bless him with many more years of life, for continuing his valuable service to the humanity. May the Almighty keep him under His special care and protection. Aameen!